The Westcliffe Jail is listed on the National Register of Historic Places. 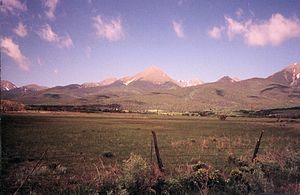 Custer County was created by the Colorado legislature on March 9, 1877, out of the southern half of Fremont County. It was named in honor of Lt. Colonel George Armstrong Custer, who had died the previous year. Originally set in Ula, the county seat moved to Rosita in 1878, and to Silver Cliff in 1886 before settling in Westcliffe in 1928. In the county, the population was spread out with 22.50% under the age of 18, 4.50% from 18 to 24, 23.30% from 25 to 44, 35.00% from 45 to 64, and 14.80% who were 65 years of age or older. The median age was 45 years. For every 100 females there were 104.30 males. For every 100 females age 18 and over, there were 102.00 males. -District 2: Jay Printz (Republican), serving from 2016 to 2020. 1st term. -District 3: Tom Flower (Republican), serving from 2017 to 2020. 1st term. Custer County is overall very conservative and heavily Republican. The most important election is not the general election, but the primary election between members of the Republican Party in August. During the 2004 presidential election, well over 60% of Custer County voters voted for the Republican candidates including George W. Bush and Pete Coors. This page was last edited on 13 December 2018, at 19:01 (UTC).